“Eat cleaner today with our light and fit grilled chicken breast option”, “Clean and simple protein for rapid muscle tone”. I’ll be the first to admit, I ate up the lie just like everyone else – the promise of health and vitality through the consumption of lean meat. I’m an athlete, of course I wanted to rebuild my muscles and perform well. I whole heartily believed and accepted our culture’s absolute obsession with “lean” protein for recovery and lean muscle maintenance. A few gross videos of the inhumane conditions of our meat industry wasn’t enough to make me completely cut ties. The last thing I wanted to be was the scrawny non-meat eater. So what made me go from occasional omnivore to cold turkey vegan in a matter of days? A little book called How Not To Die, by Michael Greger, MD. I won’t pretend to be an expert in the field of science and medicine, but the moment you take a step back and consider all the variables influencing our food system I think you’ll start questioning major food brands motives too. You owe yourself and your loved ones an honest assessment of how your food is produced, who’s marketing it ( trust me, I work in this industry), and how your body breaks it down. Dr. Greger tackles all the hard and ugly truths of our food industry sorting them out by the 15 leading causes of death in America. Interestingly enough, 14 of the 15 causes can be linked to diet and lifestyle and the 1 remaining is medical malpractice sooo don’t end up in the hospital to begin with from the other 14. To be specific, they are all linked in some way, shape, or form to the consumption of animal products. Not convinced? Check out his book. He is the only non-commercial, nonprofit, science-based doctor providing updates and resources on the latest in evidence-based nutrition on his website: nutritionfacts.org. Here are my personal top 4 motivators for quitting meat for good. Uric acid can be a double-edged sword. Too much and you run the risk of gout or kidney stones, too little and neurodegenerative disease risks creep up. Both an excess and deficiency can be linked to higher rates of mortality. So how do we maintain optimal levels? Well we have a thing we consume called purines which are the building blocks of DNA and a substance that can be broken down to increase uric acid production. There are much higher levels of the substance found in meat that can cause an excess level to build up in our systems. On the flip side fruits and veggies include everything needed to maintain and optimize uric acid levels in your body – rich in fiber, folate, and vitamin C. All valuable components to protecting you from running over or under on your uric acid levels. I’m not just talking a small disturbance here. We as a society are so used to living with aggressive inflammation NON STOP that we accept it as the norm. Just hours after eating one meat-laden meal (sausage and egg McMuffin was used in this particular study) we paralyze our arteries making their natural ability to relax impossible. The entire lining of our vascular tree becomes inflamed leaving us in a constant state of low grade inflammation. A body that stays in a state of inflammation is at huge risk for inflammation related diseases like heart disease, cancer, and diabetes. Naturally you’d want to blame the fat or protein in the meat but it turns out the people experience what is known as Endotoxemia where their blood stream is flooded with bacterial toxins (endotoxins) which are present in animal products they consume. Our bodies freak out because the dead meat bacteria toxins are not destroyed by cooking, through the digestive system or any of our filtration organs. To sum it up, our bodies detect such high levels of bacteria in meat, whether cooked or raw, that they go into hyper inflammation mode to clean our system up. That blows my mind when I used to consider chicken breast as “clean” lean meat. We know that vegetarians, specifically vegans have significantly lower body fat then their meat eating cohorts but the question is why? In a controlled study where participants exercised and ate the exact same thing aside from varying quantities of meat, those who ate upwards of 1.5 portions of meat each day crossed the BMI obesity threshold. The conclusion showed meat and more specifically fattened poultry showed a strongly positive associate to weight gain and obesity. (you can read the complete study here) Could it be that we have been mislead when it comes to the safety of eating poultry? Without a doubt. There is actually more energy from FAT in your “healthy” steamed chicken breast then from protein. 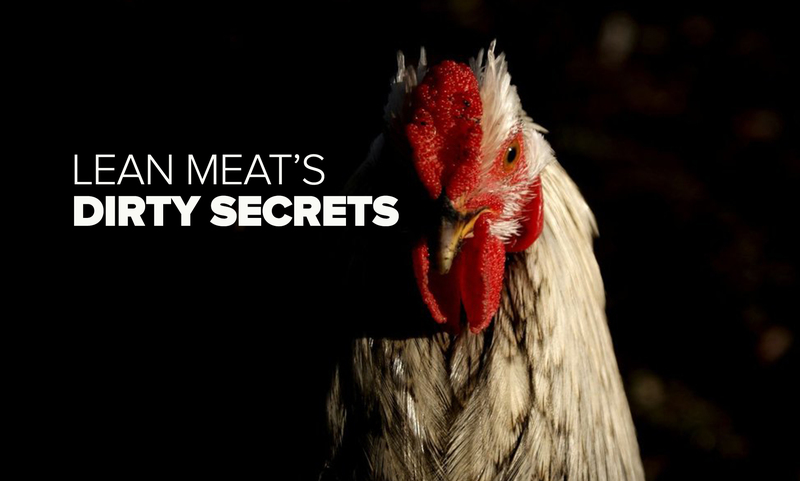 It shouldn’t be a surprise to us if we consider the current conditions a typical chicken is raised in: severely confined enclosures, restriction of any movement or exercise, growth hormone injected and fattening feed. According to the USDA , our poultry today now contains on average 18 grams more animal fat then poultry a hundred years ago. Add in the ample injection of salt water (a common practice to increase meat weight) and you have yourself a saturated fat sodium bomb bumping up your chances for obesity and heart disease all in the name of “lean” meat. There is no avoiding the pressing health epidemic this industry is posing to our society. The very sad portion of this reality is how it effects kids. Childhood obesity has increased over 100% in the last 30 years and, with that, type 2 diabetes. Statistics show once an obese child reaches 6 years of age their likely to stay above a healthy weight for the rest of their life. This all starts with their parents, schools, and what the FDA and big food corporations recommend as “safe” and “healthy”. There is nothing safe about feeding obese creatures to children. I think I’ve made it pretty clear, the meat industry is pretty disgusting. But I’ll hit it home one more time with a few other nasty facts. The meat you buy on a daily basis is far from clean. Not only have the animals been fed dirty feed, coccidiostats, and growth antibiotics but then they go through large packing and processing plants covered in guts, entrails, and diseases. You practically need to cover your kitchen in plastic and where gloves to avoid cross contamination. The most concern part of all of this is that the meat companies really don’t take anyone’s safety into consideration. Lets take salmonella, as an example. It is actually legal to sell meat contaminated with salmonella since proper cooking can effectively kill off that bacteria. But meat companies can’t be held liable for the high percentage of risk associated with cross contamination making their reckless and unclean practices profitable and increasingly dangerous. To quote the head of food safety of Costco: “You wouldn’t have a poultry industry if it weren’t for the lax laws and regulations”. And it’s not just salmonella…taphylococcus aureus, Campylobacter jejuni, and Listeria monocytogenes all can be found and sold in meat legally..sometimes in rates as high as 25% of a meat operation plants end product at any given time! The FDA went as far as to release a press statement admitting to approving mixtures of viruses as a “safe” food additives. I can’t in good conscience purchase or consume anything coming out of an industry with that level of moral negligence. I hope I’ve encouraged you to do a bit more research on this topic on your own. Ultimately, my goal is to get people to think for themselves and critically analyze the data and marketing lies we’re fed about meat and what is actually a healthy and clean to consume. Lindsey, I just stumbled across your website. Thank you SO much for this article. I have dabbled in going vegan, but have found it somewhat difficult to give up chicken and especially eggs. Although I do buy the organic grass fed chicken eggs. I see you at a lot of races. As an “older” runner, I find it confusing on how to properly fuel and have the energy I need to run. I’ve looked into the keto lifestyle but it is high meat consumption. Maffetone method highly promotes this. I also find it confusing on how to replace the protein after workouts without meat/eggs/animal protein based drinks. Your article has inspired me.